It will be used to contact you for RFP/Project purpose only. Got a project in mind? Let's get connected to discuss your idea. As the world is being driven by technology, newer concepts are gaining prominence. One of them is Big Data Analytics which helps collect large volumes of data and analyzes them at lightning speed. With the help of Big Data services, businesses can improve productivity and performance and reach end consumers faster. Industry experts are predicting that Big Data has the potential of changing the way businesses process and analyze data. However, with the concept still being new to many enterprises, confusion persists on how best to use it. While there are several things that work for Big Data, enterprises are also making numerous mistakes while using it. Below we look at six mistakes enterprises commit while using Big Data project. The most basic question that any enterprise should ask before adopting Big Data is “Why do we need it?” Unfortunately, most are simply jumping into the bandwagon without defining the business problem that can be solved using Big Data. Dumping data for the sake of doing so is useless, unless some real analytics is drawn from it. Proof of concept (POC) is considered to be a valuable element of Big Data projects. Also known as the “proof of value”, it helps identify and define the benefits of the project. The POC must address the real need of the project, without forgetting to highlight whether it is doable or not. Another mistake enterprises make while using Big Data is that they tend to rely only on technology. What many fail to understand is that Big Data is more like a powerful set of tools – it is not the solution. Collecting data with the help of technology isn’t enough. What is more important is understandingthe significance. Human resource is a vital clog in the wheel for any technological innovation. When Big Data is looked solely from a technological viewpoint, the wheel is bound to have problems. Data scientists or the persons who know how to work with large amounts of data are very important. Their knowledge and ability to understand analytics in-depth is what can help enterprises with Big Data. Unfortunately most enterprises ignore these data scientists. Without a fair understanding of how Big Data can be beneficial, enterprises make the mistake of falling back on tried and tested formula while interpreting data. Relying on such a formula can lead the enterprise to falsely conclude data. It has been a problem even with traditional analytics, where no action is taken after the results are out. Unless lessons are learnt from the analytics, there is practically no use of incorporating Big Data into an enterprise. It is very important that a model is operationalized so that it becomes actionable. Semaphore Software provides Cloud Computing App Development and Big Data Analytics services that help enterprises take better business decisions. 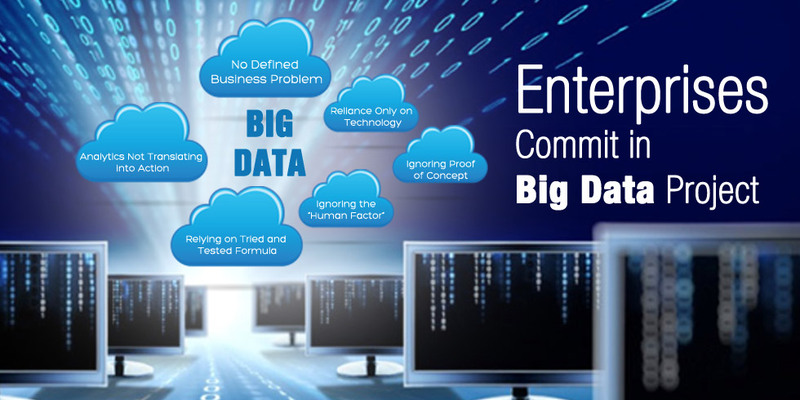 Contact us through info@semaphore-software.com to know more about our Big Data services. Request a free estimation and get a quote for your project.